Priced at a mere $8, the Motorino Pizza Cutter from Kikkerland is sure to become a hit with those seeking to fill their lives (and homes) with all things scooter. The cutter, based on the silhouette of a Vespa P-series, features a working kickstand and—according to Kikkerland—cuts pizza twice as fast as those plain ol’ single-bladed pizza cutters in most of our kitchen drawers. As manufacturer claims about scooter performance is often a tad optimistic, we’ll take that with a grain of salt. 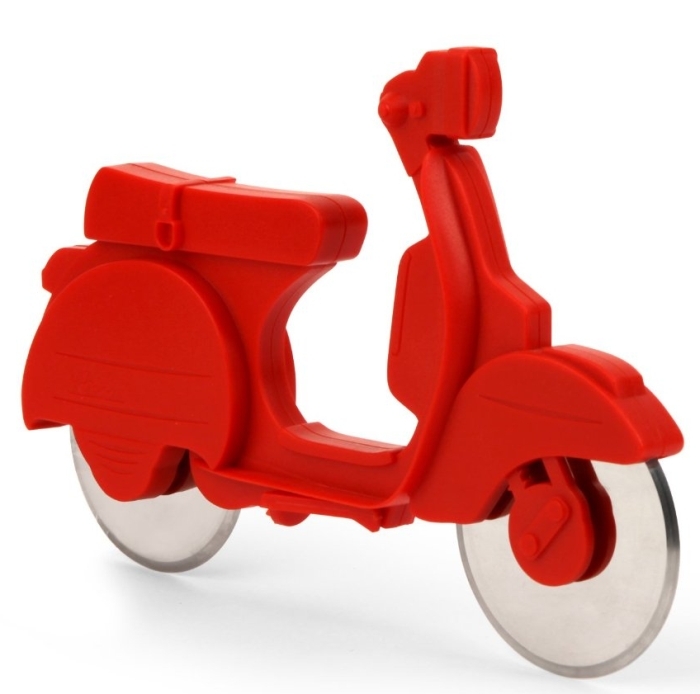 Snag the scooter cutter at Amazon or add it to your holiday gift list. Eric Almendral lives and rides in Los Angeles while making a living as a creative director and occasional writer, illustrator and journalist. In addition to being an Editor at ScooterFile, he runs ModernBuddy.com, the Los Angeles Scooter Group and is a Board Member of the Vespa Club of America. ScooterFile’s Adam Hockenberry recounts an evening of mischief wherein brave riders pitted wit and pool toys against each other in glorious scooter combat.